This easy to make peach tart is made with a buttery pie crust, a cream cheese filling and baked peaches on top. Sometimes when I go to the farmers’ market I get carried away and buy more things that we can eat and this is why I wanted to make a tart, as I had a lot of peaches and grapes to use. Would you believe that this is the first time I am making a tart? I was kind of afraid to try making tarts and although I bought a tart pan many years ago, I never used it. After reading some recipes, I saw it was quite easy, so I decided it was about time to make my first attempt. See step by step instructions here. (You will be seeing more recipes soon, as I have already made two more). For the filling and topping I already decided what to do before finding a recipe. At the beginning I planned to use only peaches but the tart looked empty so I filled in the gaps with the grapes and this makes it look and taste even better, but if you don’t have any, just add the peaches. Instead of following the directions to place crust weights on the crust and bake it for 25 minutes I baked it together with the filling for about 1 hour until golden brown and filling was almost set. I am send this recipe to Bee and Jai of Jugalbandi, whose theme for their month’s Click Event is crusts. In a bowl place the flour and sugar. Pulse to blend together. Add butter and pulse until dough just begins to come together. Pat the dough onto the bottom of the tart pan and up the sides of the pan. Cover with plastic wrap and place in refrigerator while you make the filling. Add the sugar and mix well. Blend in the egg and vanilla extract and mix until smooth. Remove the crust from the fridge and pour in the filling. Return to refrigerator while you prepare the topping. Combine the sugar and cinnamon on top of the sliced peaches and mix. Roll out dough and place in a greased and floured 22 cm tart pan. Add the cream and then arrange the fruit on top. (At the beginning I planned to use only peaches but the tart looked empty so I filled in the gaps with the grapes and this makes it look and taste even better, but if you don’t have any, just add the peaches). Preheat the oven to 180 degrees C and place rack in center of oven. Bake for about 1 hour until golden brown and filling has set. Remove from the oven and place on wire rack to cool. Leftovers can be covered with plastic wrap and refrigerated. In a bowl place the flour and sugar. Add butter and pulse until dough just begins to come together. Pat the dough onto the bottom of the tart pan and up the sides of the pan. Cover with plastic wrap and place in refrigerator while you make the filling. Add the sugar and mix well. Blend in the egg and vanilla extract and mix until smooth. Remove the crust from the fridge and pour in the filling. Return to refrigerator while you prepare the topping. Add the cream and then arrange the fruit on top. Good morning Ivy! It happens the same to me all the time! Going to the farmer’s market with a purpose and comming back home with too many things I didn’t plan to buy… but when I see those figs and peaches and melons… and mangos! Last Friday I bought 3 for 1 Euro!!!!! Amazing, they were Brazilian! Your tart looks delicious and with all the fruit I have I should definitevely get started one day! Do you think mangos and kiwis would fit? Hola Nuria. I have never tried the combination of mangoes and kiwis but my instinct tells me that it would be a great combination. I would definitely try it. I also bought a lot of figs which I had to use in the end so I will be posting about figs as well. This tart really doesn’t look like its your first. Grapes and peaches is an unusual combination. Aparna, well it’s the first time regarding the crust. 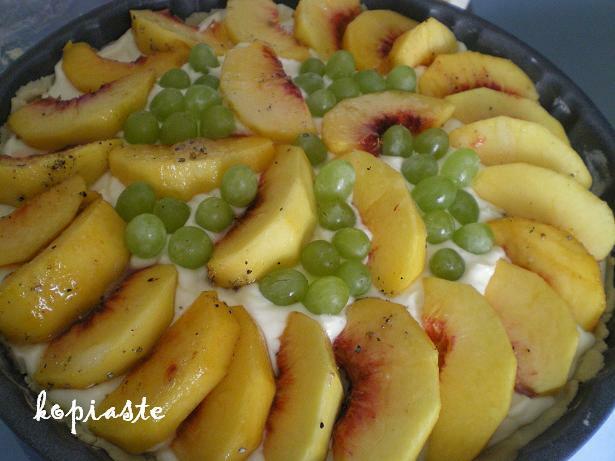 I’ve used the cream cheese in many recipes and the combination of peaches and grapes was great. Am also bitten by the farmers market sort of bug…sometimes I curse myself for lugging more work home. But bad habits die hard…& wonderful pies like this are born! The crust looks great & anything peach sings to me! Great one Ivy…will have to wait for peaches until next summer. Ivy, thank you so much for visiting my blog. I see you live in Greece. How romantic. It must be a beautiful city. Maybe someday I can visit there. I love your peach tart. It looks delicious. I will list you in my favorites so that I can find my way back. Hi Teresa, it’s nice to see you here for the first time, so welcome and shall be looking forward to seeing you again. Greece is a beautiful country but I see Mexico as a very beautiful place I would like to visit as well. Thanks for adding me in your list and I will add you in my blogroll as well. Mmmmm..the tart looks heavenly Ivy. Peaches are my favourite and I can’t wait for summer! Ivy this tart looks so delicious! Thanks Sripriya, Peter G and Maria. I get carried away when I go to the farmers market and today I bought tons of fruit again.